Understanding and quantifying human preimplantation development in order to predict its outcome. Image based analysis of human embryos used in IVF procedures. 50% of IVF cycles are followed by time lapse imaging. It is currently used as a tool to exclude embryos with abnormal development. Our aim is to develop an algorithm able to select embryos with the most chance to implant and lead to a pregnancy. P. Paul-Guilloteaux, from the imaging core facility of Nantes, is collaborating with our bioinformaticians to analyze the morphokinetic characteristics of human preimplantation development. Molecular analysis of human embryos donated to research. 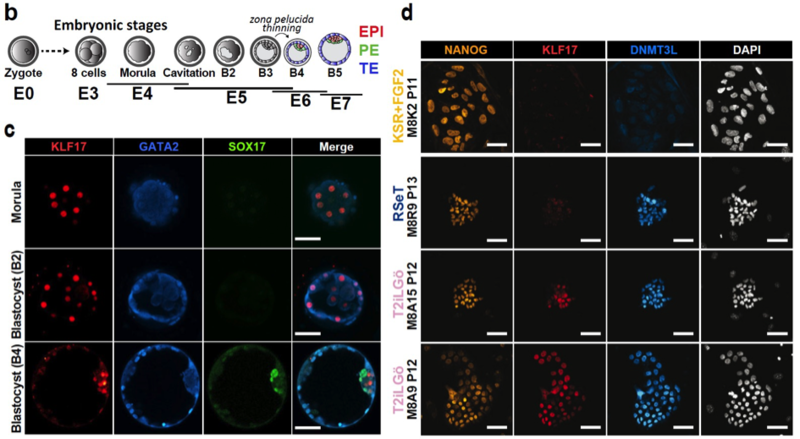 We have performed single-cell RNAseq and confocal imaging on human blastocysts. Each studied embryo has been flowed by time lapse, linking our fundamental and clinically-related research. Modeling of human embryos with stem cell models: human naive and primed pluripotent stem cells. We have developed a reprogramming method to directly generate naive and primed induced pluripotent stem cells, in parallel, from the same donor. We use those cellular model to study the regulation of human pluripotency. Bioinformatics modeling of cell fate decisions based on transcriptomic data. Using our datasets of single-cell RNAseq, and DGE-RNAseq (a cheap and quantitative RNAseq that I imported from the broad institute), we are modelizing cell fate regulation in human preimplantation embryos and human pluripotent stem cells. For this project, we are collaborating with J. Bourdon, Assistant Professor in informatics at university of Nantes (metabolism and single-cell analysis), and C. Guziolowski, Assistant Professor at Ecole Centrale de Nantes (gene regulatory networks).